Julian wants Sonny to forgive him for Alexis&apos;s sake. However, Sonny threatens Julian for killing Duke and promises that he&apos;ll destroy Julian when the time is right. Robert and Anna end up in Halifax, checking clinics for Sabrina and Carlos. Meanwhile, Sabrina&apos;s going stir crazy, holed up in the cabin, and is upset that she hasn&apos;t had a check up since they&apos;ve gotten there. Sabrina&apos;s worried about the baby, after what happened to Gabriel. Carlos promises to get her to a clinic. Darby checks in on Morgan during his first day on the job. The two make out amongst the coffee beans until Morgan puts a stop to it. Paul leaves Kiki a huge tip and she wonders if it&apos;s because of Ava. Kiki thinks the two are friends, but Paul denies that. He says he&apos;ll be prosecuting Ava, if he ever finds the evidence against her. Ava tells Carly that she won&apos;t let CarSon see more of Avery. Carly accuses her of being selfless and not putting Avery&apos;s needs ahead of her own. Ava counters that Carly manipulated Kiki into taking her side. Carly promises that she and Sonny will get Avery back. Paul questions Ava about his run in with Kiki. Ava says Kiki knows nothing of their true relationship, just that he&apos;s a art lover. Paul says he&apos;s jumpy because of Anna. Ava wonders if Anna will be a problem for them but Paul reassures her. Sonny and Carly are surprised to find Darby at the warehouse. They get angry with Morgan for hooking up with her. Morgan says he stopped anything before it started. He insisted they need to trust him and treat him like an adult. Carly tells Sonny about her encounter with Ava and wonders when he&apos;s going to take action on getting Avery back. Sonny says he messed up the last hearing so they need to be patient and get an airtight case against Ava. Julian runs into Kiki, tells her about the wedding and invites her, which Kiki accepts. Ava arrives and tells Kiki that she won&apos;t be letting CarSon have more access to Avery. 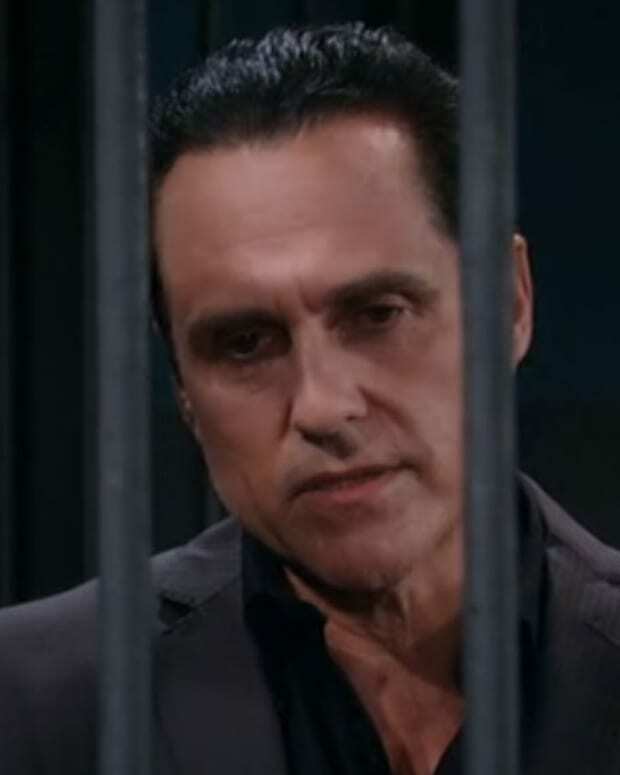 Julian tells Ava that Sonny put a curse on him because he believes Julian&apos;s still in the business. Julian warns Ava to stop whatever she&apos;s doing so that it doesn&apos;t take him down as well. Morgan tells Kiki that he&apos;s feeling clearer headed now and that she&apos;s always been there for him. Morgan wants them to be more than friends. When he&apos;s alone, Sonny stands up from the chair. Carly walks in on it. Carlos takes Sabrina to the clinic for her prenatal appointment but spots Anna and Robert and brings her back to the cabin. Carlos wants them to leave town, but Sabrina says the baby is coming.